"The Unicameral" redirects here. For the general concept, see Unicameralism. For other uses, see Unicameral (disambiguation). The Nebraska Legislature (also called the Unicameral)  is the supreme legislative body of the state of Nebraska. Its members are "senators." The legislature is officially unicameral and nonpartisan, making Nebraska unique among U.S. states; no other state has either a unicameral or a nonpartisan legislative body, but partisanship does occur in a de facto fashion. With 49 members, it is also the smallest legislature of any U.S. state. Many possible reasons for the 1934 amendment's victory have been advanced: the popularity of George Norris; the Depression-era desire to cut costs; public dissatisfaction with the previous year's legislature; or even the fact that, by chance, it was on the ballot in the same year as an amendment to legalize parimutuel betting on horse races. This final coincidence may have aided the measure's passage in Omaha, where the unicameral issue was not a pressing one but horse racing was. (Gambling interests campaigned for "yes" votes on all amendments in hopes of assuring the horse-racing amendment's passage). The Legislature is composed of 49 members, chosen by a single-member district or constituency. Senators are chosen for four-year terms, with one-half of the seats up for election every second year. In effect, this results in half the chamber being elected at the same time as the President of the United States, and the other half elected at the same time as other statewide elections. Senators must be qualified voters who are at least 21 years old and have lived in the district they wish to represent for at least one year. A constitutional amendment passed in 2000 limits senators to two consecutive terms. However, a former senator is re-eligible for election after four years. Senators receive $12,000 a year. The Lieutenant Governor is the President of the Legislature and the official presiding officer. When presiding, the Lieutenant Governor may vote to break a tie in the Legislature, but may not break a tie when the vote is on the final passage of a bill. The highest position among the members is the Speaker, who presides over the Legislature in the absence of the Lieutenant Governor. The Speaker is elected by floor ballot (or secret ballot) for a two-year term. The Speaker, with the approval of the Executive Board, determines the agenda (or the order in which bills and resolutions are considered on General File). The Speaker's agenda may be changed by a three-fifths vote of the elected members of the Legislature. The Speaker is not a member of any committee, but is an ex-officio member of the Rules Committee and the Executive Board. During each legislative session, with the approval of two-thirds of the Executive Board, the Speaker is authorized to designate up to five bills, or proposed constitutional amendments, as "Major Proposals." Major Proposals are limited to bills or resolutions previously designated as a committee priority, senator priority, or general appropriation bills. Unlike most bills, the Speaker is permitted to determine the scheduling of a Major Proposal as well as the order of amendments and motions to be considered. Administrative matters of the body are dealt with by the Executive Board. The Board includes the Speaker, a chairman, a vice chairman, and six other senators. The chairman and vice chairman are chosen by floor ballot (or secret ballot) for two-year terms by the entire legislature. The chairman of the Appropriations Committee serves, but cannot vote on any matter, and can only speak on fiscal matters. The Executive Board is also the Referencing Committee. All bills introduced are referenced by the Referencing Committee to the committee whose subject relates to the bill. Members of the Legislature may object to where a bill was referenced and may attempt re-refer the bill to a different committee by a majority vote. Senators are classified into three geographically based " caucuses." Each caucus elects two board members who serve on the Executive Board and four members who serve on the Committee-on-Committees. The Legislature is responsible for law-making in the state, but the Governor has the power to veto any bill. The Legislature may override the governor's veto by a vote of three-fifths (30) of its members. The Legislature also has the power, by a three-fifths vote, to propose a constitutional amendment to the voters, who then pass or reject it through a referendum. Committee chairs are elected on the first day of the 90-day session and serve until the end of the 60-day session. Committee chairs are elected directly by the entire membership of the Legislature. On the first day, those wishing to run for a committee chair give a brief speech as to why they believe they're qualified, and following the speeches for that committee, members use a ballot vote to choose who they wish to serve as committee chair. The first Unicameral allowed each committee to select its own committee chair in 1937; from 1939-1971 the Committee on Committees designated the committee chair; and from 1973 to presently committee chairs are chosen by ballot. The Speaker, Committee on Committee Chair, and the Chair and Vice Chair of the Executive Board have been chosen by floor ballot since the Unicameral's first day in 1937. 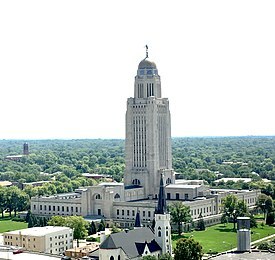 The use of a ballot vote and a committee-on-committees is unique to Nebraska. Most legislative bodies in the United States give the Speaker/Majority Leader the power to appoint both committee membership and the committee chairs. ^ Chambers previously served from 1971–2009, prior to the introduction of term limits. ^ Lathrop previously served from 2007–2015, being term limited in 2015. ^ LTC. "Nebraska Legislature - About the Legislature". ^ Williams, Beth (October 2013). Exploring Initiative and Referendum Law. Google Books: Routledge. p. 207. ISBN 9781317965268. Retrieved 10 January 2018. ^ Berens, Charlene (2004). Power to the People: Social Choice and the Populist/Progressive Ideal. Lanham, Maryland: University Press of America. p. 252. ISBN 978-0-7618-2763-4. ^ Kelly, Michael (February 16, 2014). "Kelly: 'The Unicameral' — Nebraska-born, though not spread". Omaha World-Herald. Retrieved May 19, 2018. ^ "Rules of the Unicameral Legislature" (PDF). Nebraska Legislature Website. March 25, 2018. ^ Bureau, Joe Duggan / World-Herald. "Nebraska Legislature Rules Committee votes against changing filibuster rules and ending the secret ballot for leadership positions". Omaha.com. Retrieved 2018-03-25. ^ "Rules Committee Transcript 01/11/2017" (PDF). Nebraska Legislative Website. May 25, 2018. ^ "Rules debate once again zeroes in on secret ballots to elect leaders in Legislature". Lincoln Journal Star. January 23, 2019. Retrieved January 26, 2019. ^ "Gov. Ricketts Appoints Slama in LD1 | Office of Governor Pete Ricketts". governor.nebraska.gov. Retrieved 2018-12-29. ^ a b c d e f g h i j k l m n o p q r s t u v w x y z aa ab ac ad ae af ag ah ai aj ak al am an ao ap aq ar as at au av aw ax ay az ba "Session Laws: Nebraska". HeinOnline. New York: William S. Hein & Co., Inc. Retrieved April 17, 2019.